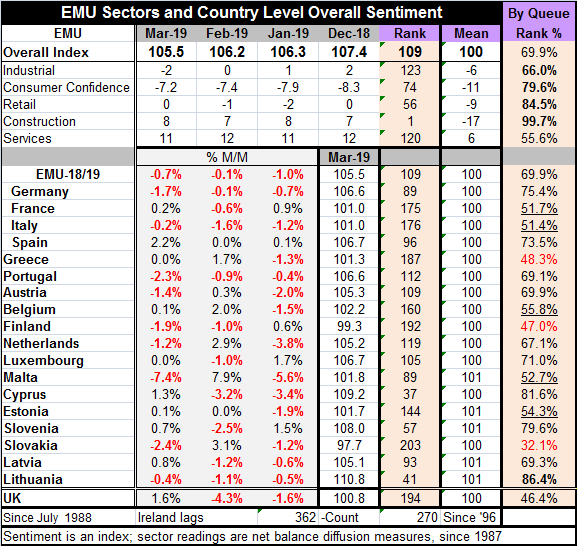 The EU Commission Index for the EMU fell to a steeper-than-expected 105.5 in March from 106.2 in February. The fall takes the headline index down to a 69.9 percentile queue standing among its historic results, a moderate but firm standing. The index has fallen from a peak of 114.5 in this cycle reached in December 2017. A reading lower than 105.5 was last logged in October 2016 when the index stood at 105.4. Sector results in March show weakening in the industrial sector and in services. Modest improvements were chronicled for consumer confidence, retailing and construction. The industrial metric posted a negative reading of -2 in March, its first negative reading since September 2016. Construction continues to post the highest queue standing at 99.7%, with retailing next (84.5%) followed by consumer confidence (79.6%). The industrial sector has a 66th percentile or top one-third standing. Services have only a 55.6 percentile standing, marginally above their historic median. The sector standings show that growth is still largely in gear. The diffusion readings show only one sector negative out of five and the standings all are above their sector medians. The EU Commission indexes show some of the slowest growth since 2016, but that is not a damaging assessment by any means. It only compares back to a period of moderation. While the monthly index was weaker than expected, it is still at a level from which it has been stronger only about 30% of the time. The strongest country percentile queue standing is tiny Lithuania at 86.4%. Among the four largest EMU economies, Italy and France have standings in their 50th percentile range while Spain and Germany have mid-70th percentile standings. Only Greece, Finland and Slovakia have queue standings below their 50% level (below their respective medians). Five countries have standings in their 50th percentile range. There are two 80th percentile range standings and four in their 70th percentiles. All in all, there is not the kind of strength with many 80th and 90th percentiles by country and sector that we saw a year ago. But most readings are above their 50th percentile and for standings 50% marks their respective medians. So growth is quite secure, but it does not amount to strength. And then there is the matter of a weakening and negative reading in manufacturing, an important and often bellwether sector. Further there is the issue of still fading momentum. So the problem for Europe is not the present, it is the concern about the future.